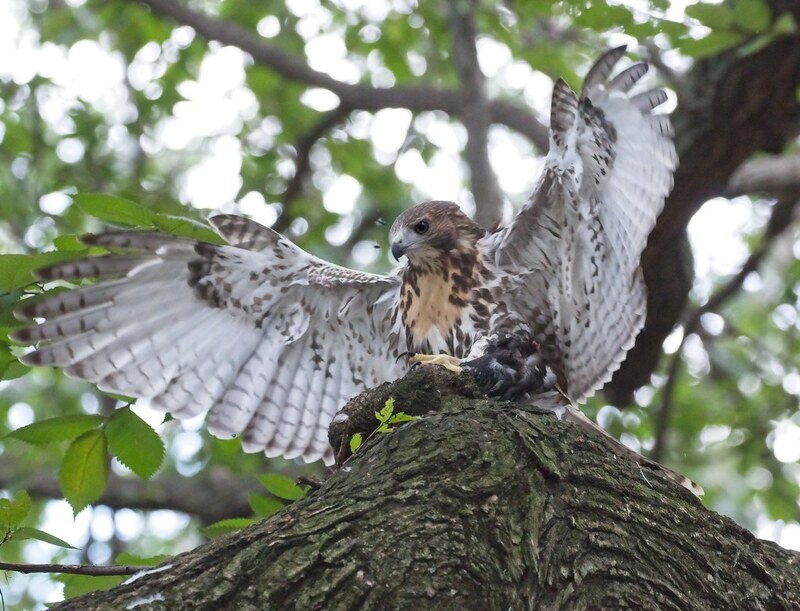 It's been a very difficult and emotional time after losing the older of the Tompkins Square red-tailed hawk fledglings to rodenticide this last Sunday. 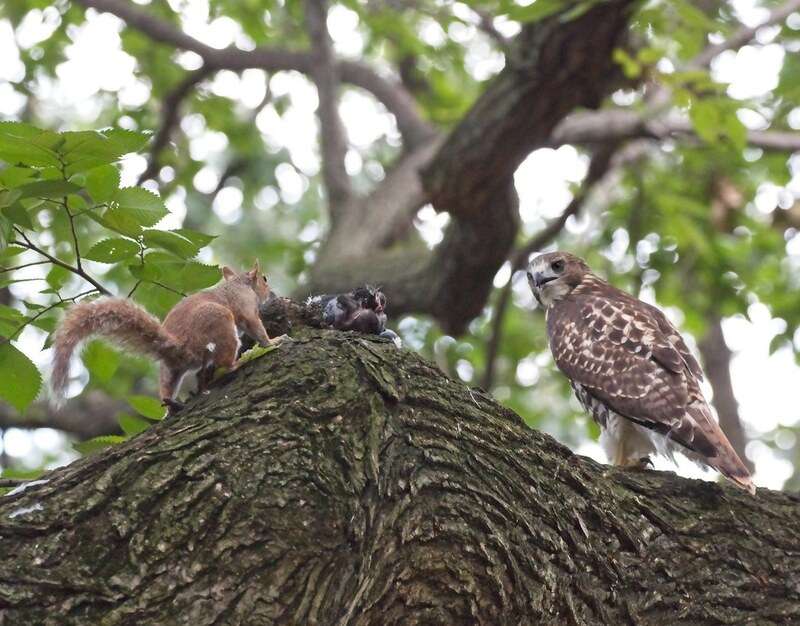 How could I enjoy watching the remaining sibling play in the park knowing how the other hawk suffered? 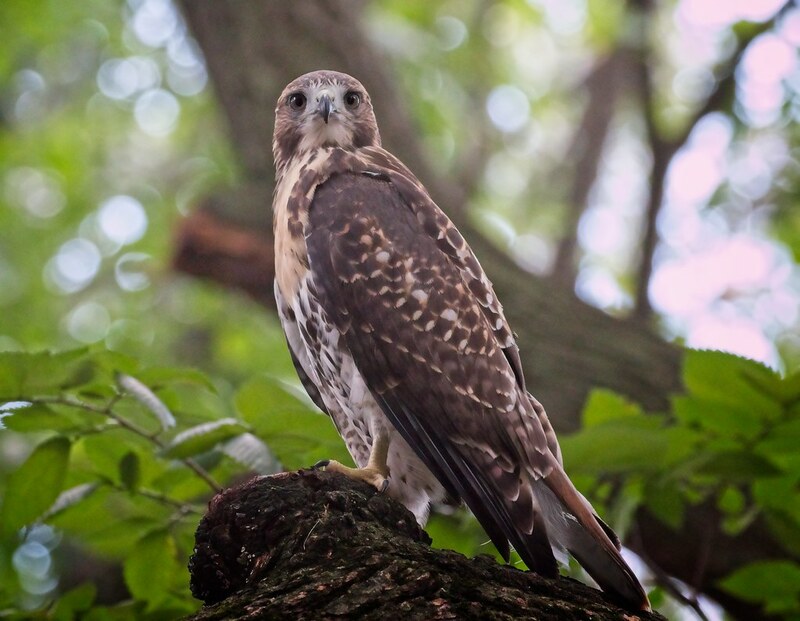 Mom Amelia had stayed close to both young hawks and perched alongside the older fledgling in their favorite tree before he was taken to rehab. 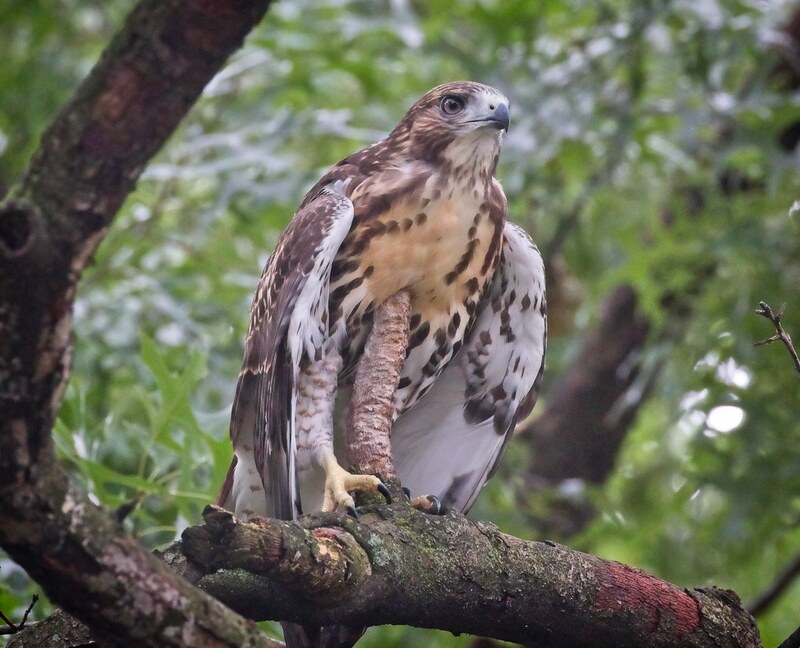 Both parents were in a nearby tree when the Urban Park Rangers took the hawklet away, so they no doubt saw what happened. Afterwards, Amelia perched high on the Village View buildings along First Avenue and spent most of her time there rather than in the park. Since laying eggs, she has been an extremely vigilant mom, staying on the nest throughout the nesting time, and then staying very close to both kids once they fledged. Did she grieve? Did she know her job was done? 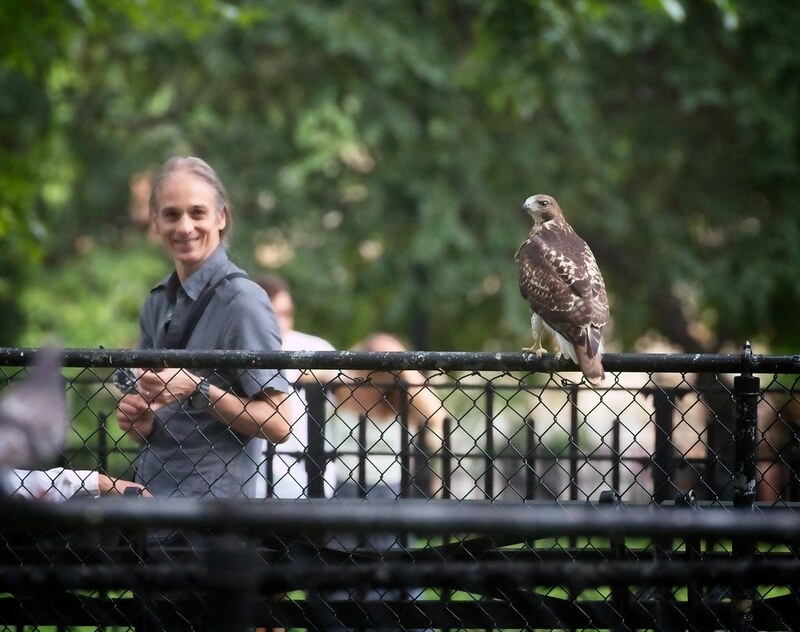 I don't know, but I know I was sad seeing her perched far away with her back to the park. 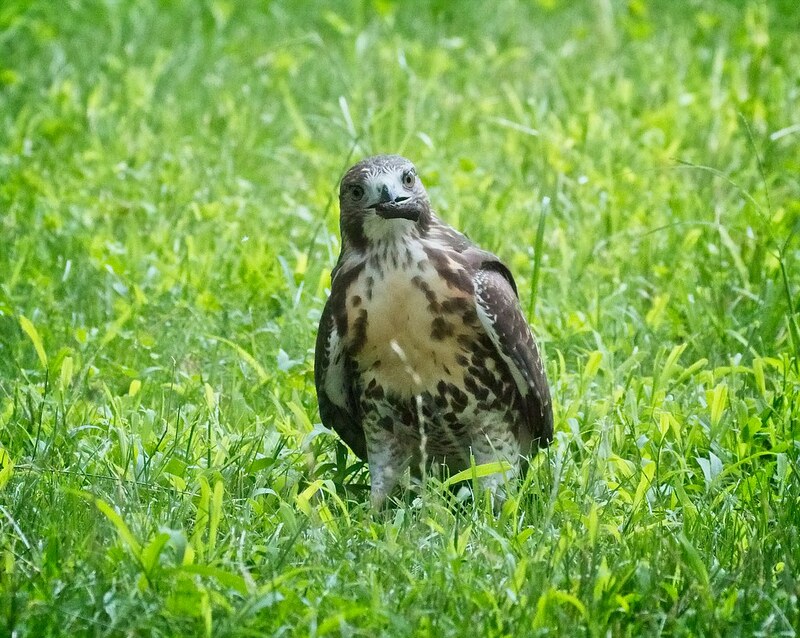 After a couple of days, I saw Amelia in the park again, and she is actively watching over the younger fledgling. Dad Christo has been ever-present, teaching the young one to hunt and staying very close to ward off squirrels and birds who might harass the fledgling. He's also been bringing it food, although the kid is learning to hunt very quickly and has shown some really impressive skills. This particular fledgling is quite a character, making me laugh with his antics. 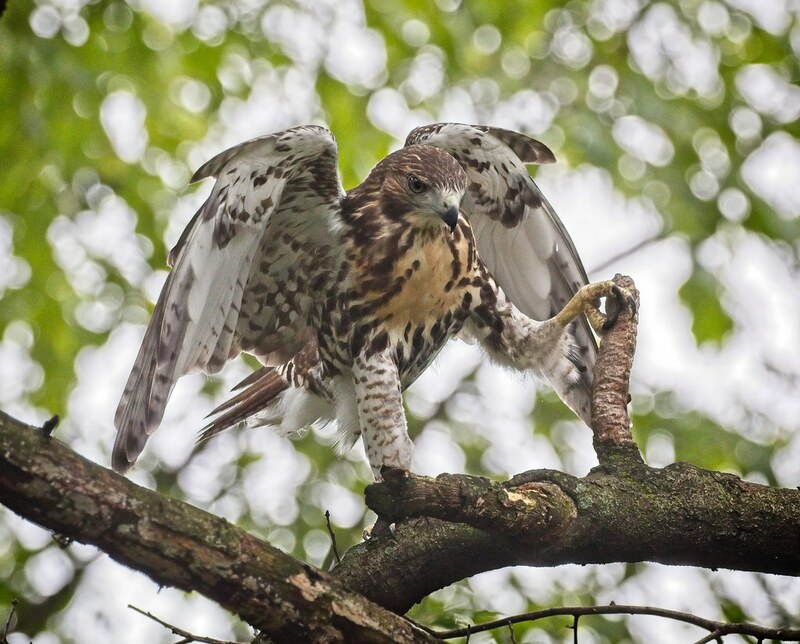 I don't remember any of the previous hawk offspring having so much personality. Below, he shows off his wooden leg. Wait, what? Heh, it's just another toy! 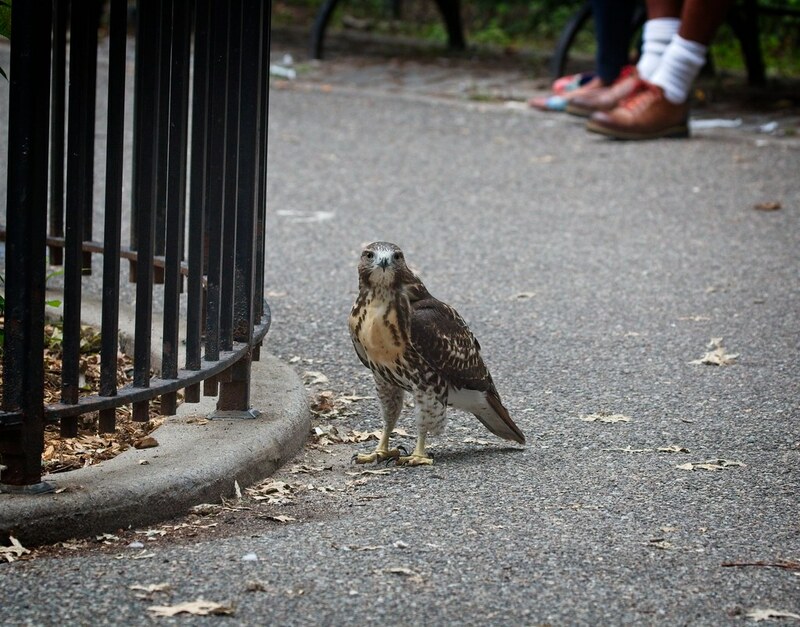 This hawk has been taking advantage of all the fun to be had in Tompkins Square. 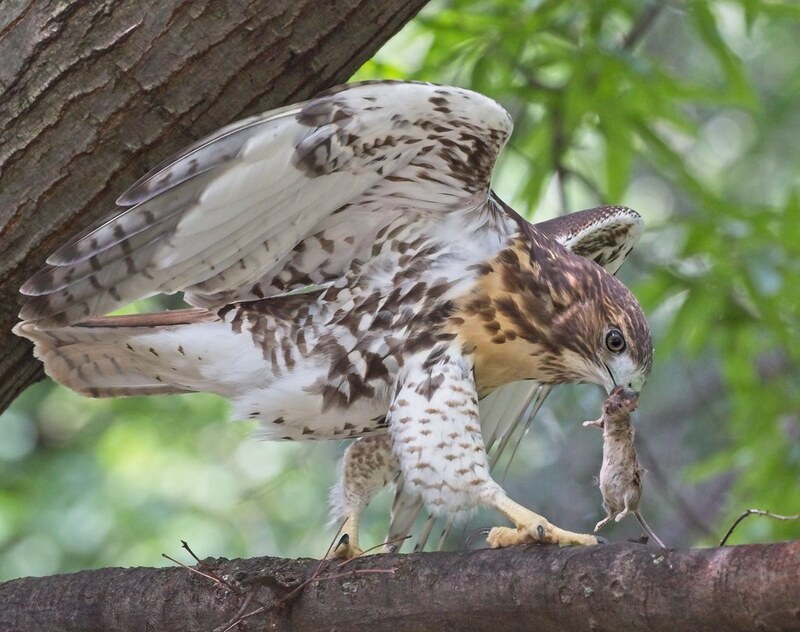 ...and is quickly run off by the hawk. No one is taking his leftovers! 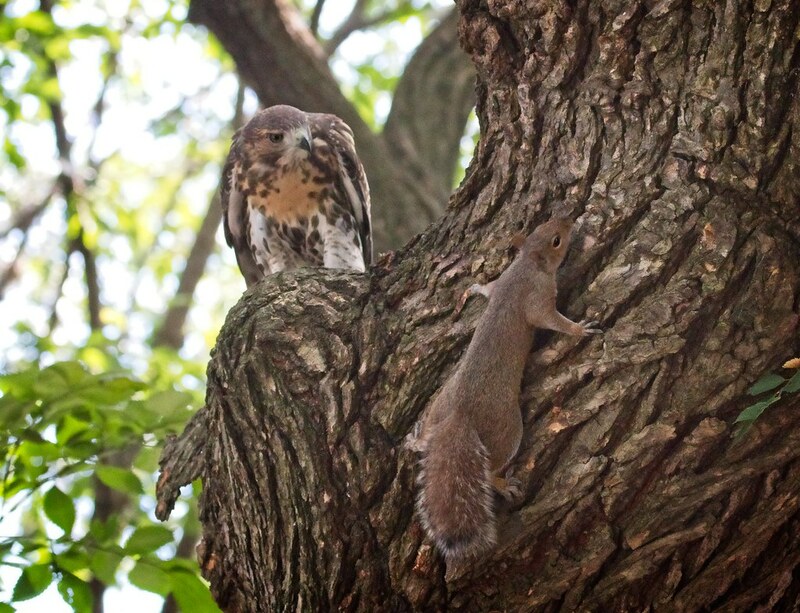 Seconds after this happened, Christo, who had been perched a few feet away, chased off the squirrel. But the squirrels don't back down so easily. They're extremely territorial and don't like having predators hanging around in their trees. I'm estimating this hawk hatched around June 1, making him just two months old. He's definitely still a kid, as he demonstrates by playing with a piece of wood in the grass. What trouble can I get into now? How about crawling under the fence to get at a sparrow? 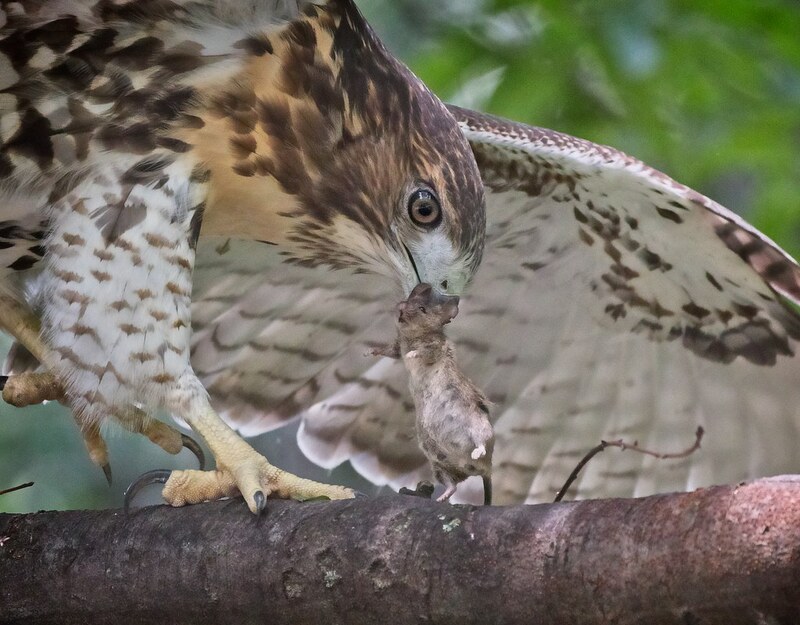 Silly hawk! 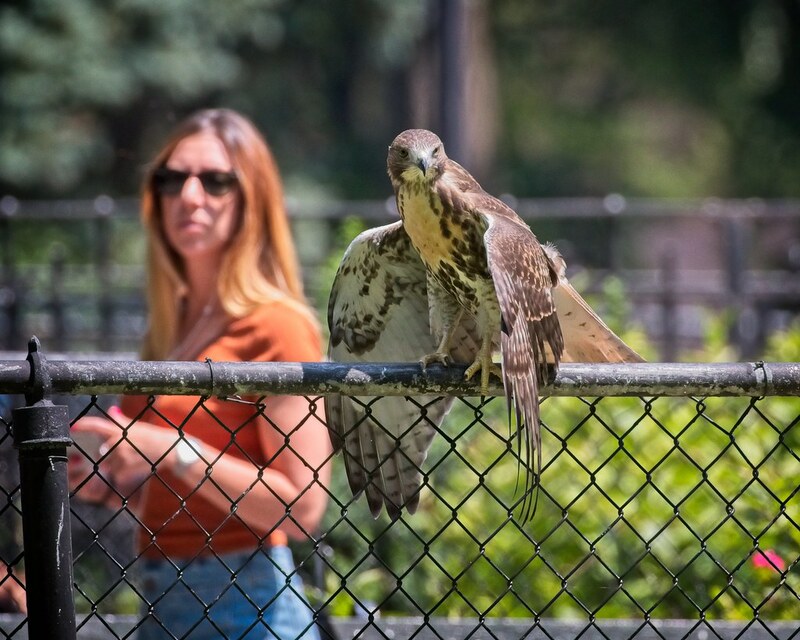 When this little guy fledged the nest on July 14, he spent the day on the roof of St Brigid's church before jamming himself between the bars of a fire escape on E 8th Street. I thought that might teach him a lesson to not do that again, but nope! 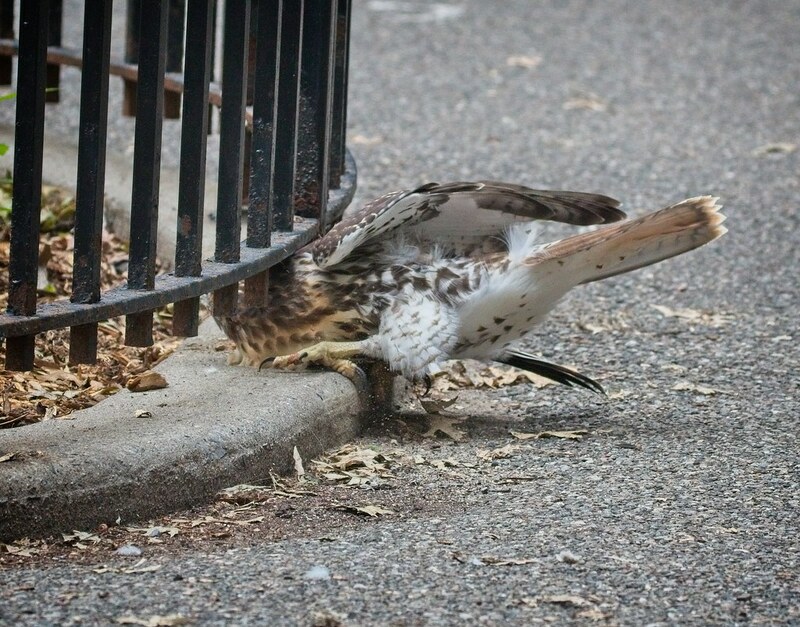 After the photo above was taken (July 30), the hawk, after realizing he wouldn't fit under the fence, backed out and decided to walk through the bars to get to the other side. 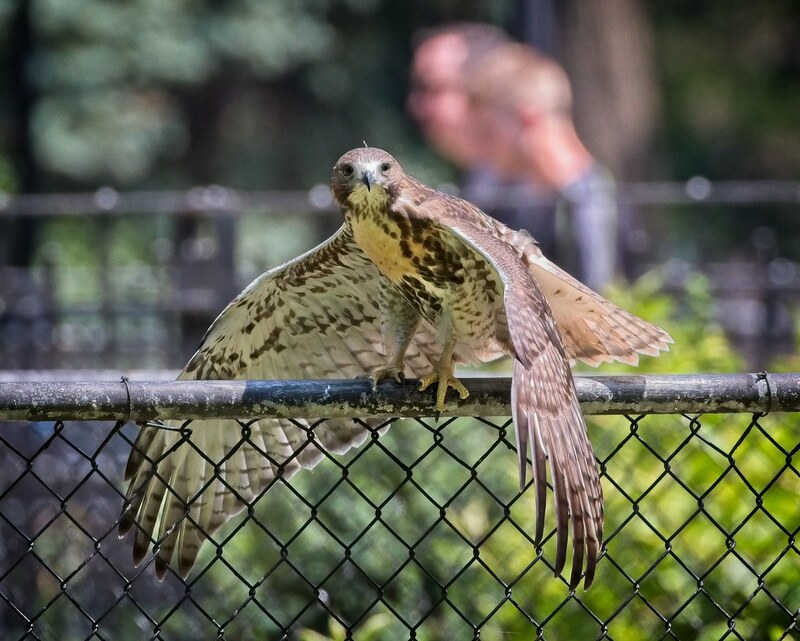 The following morning (July 31), a fellow hawk-watcher saw him crawl under and through another fence after catching his first pigeon. Why fly over the fence when you can just walk right through? As mentioned above, this precocious little guy caught his first pigeon on July 31. Until then, he has regularly been catching mice since July 22. I don't recall past fledglings catching prey so early in their development. What I enjoy most about the hawks at this age is how they surprise and delight people. I love to see the happy expressions on faces of people when they first notice something unexpected and extraordinary right in front of them. This never gets old. 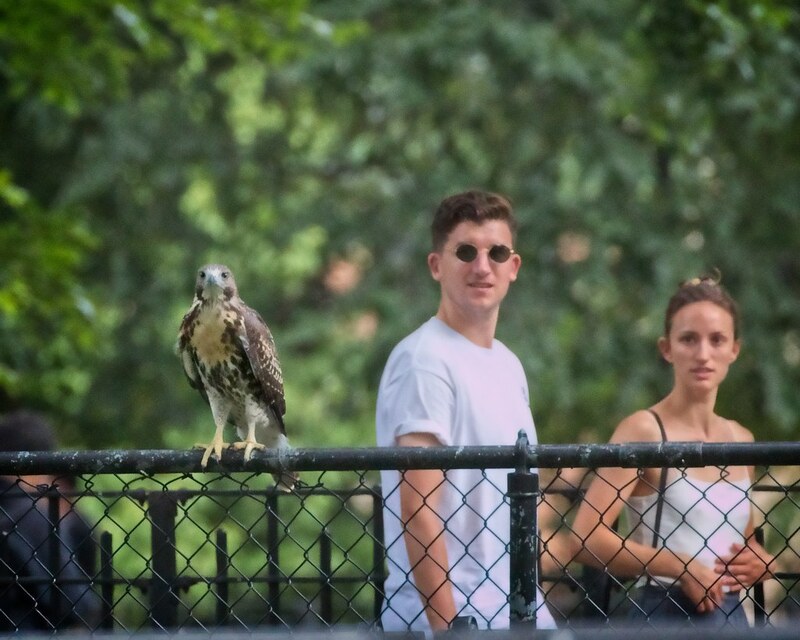 After a dramatic nesting season and the tragic and unnecessary loss of the older Tompkins Square fledgling, this little hawk is very special and deserves our love. 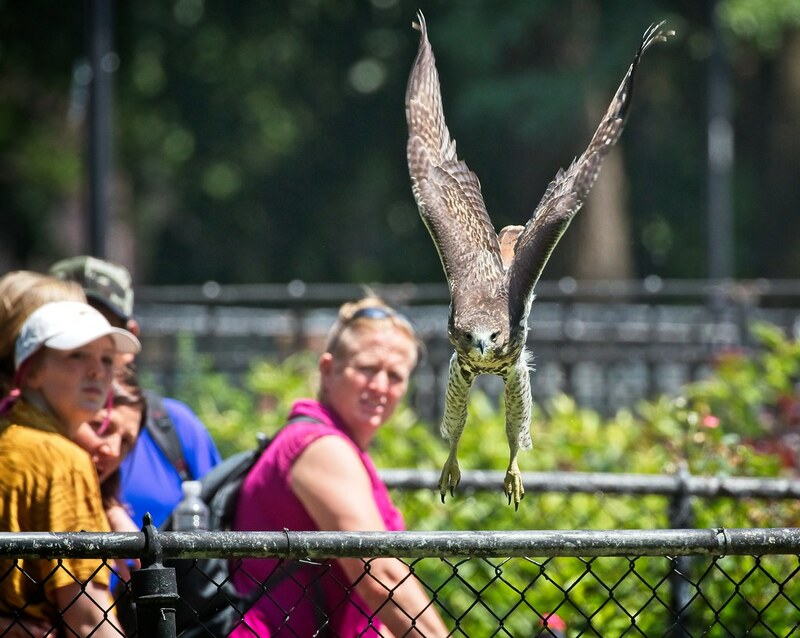 The more people who watch and care for the hawks, the better. We are privileged to witness their lives up close and personal here in the city, and I hope experiencing them makes people think about our environment and how to take care of it. 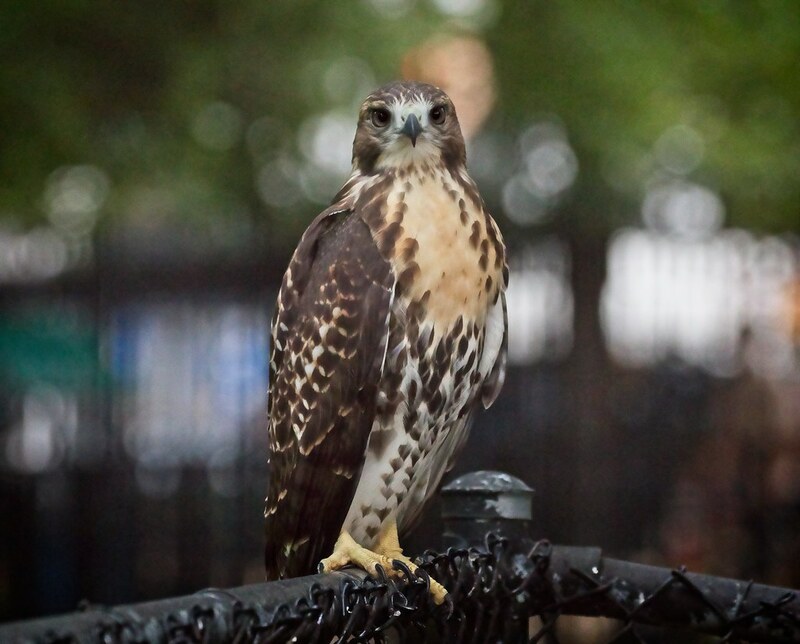 You can see many more recent Tompkins Square hawk photos on my Flickr page.